Due to Eye being largely an open, free-form dungeon that allows you to do bosses in any order (excluding the final boss), you can approach it in a number of ways. We would, however, advise taking the left after Warlord Parjesh, and moving in a circle around the dungeon to end at King Deepbeard. A majority of the trash between the entrance of the dungeon and Warlord Parjesh can be skipped, in a variety of ways. The easiest is to move down the left, which will limit the number of pulls down to two or three, depending on your strategy. Hatecoil Stormweavers and Hatecoil Warriors will spawn on the left side together, one of each. You should pull and kill the first group, and watch for the Stormweaver's casts. Storm should be the highest priority, as it deals a great deal of AoE damage to the group, and any spare interrupts should be spent on Arc Lightning, which will chain between players. Try not to waste any on Lightning Blast, if possible; healers should try to deal with these casts. Hatecoil Warriors will use a frontal cone that leaves a bleed called Coral Slash, which means they should always be faced away from the group (and the melee in particular). At 50% health, the Warriors will Enrage, but these adds are a lower priority in comparison to the Stormweaver. Only one Hatecoil Oracle will spawn alongside a Hatecoil Wrangler in the following pull, which will be a high priority target. Rejuvenating Waters should be interrupted as the highest priority, and stuns should be liberally used here to manage the frequent casts from both adds. Arcane Bolt from the Oracle is less important, but spare interrupts can be thrown on this. Wranglers will cast Hooked Net on a random non-tank player, rooting them and dealing moderate Physical damage. They will also cast Lightning Prod that will deal heavy Nature damage to all players in range, and also aggro any of the neutral Wandering Shellbacks nearby and Enrage them, so position these accordingly, as it cannot be interrupted. The Hatecoil Crusher patrols down the path heading to Lady Hatecoil, and can be pulled with the Hatecoil Oracle/Hatecoil Stormweaver. This deals high tank damage alongside casting a sequence of Mighty Slam for high tank damage, and then Thundering Stomp dealing group damage and knocking players back. The latter can and should be interrupted, but do not do so at the expense of not interrupting Rejuvenating Waters. Prioritise killing the Hatecoil Crestrider, interrupt Restoration and Bellowing Roar. Try to hit adds with Impaling Spear, avoid Crashing Wave and Quicksand left behind. Parjesh enrages at 30% health remaining. Parjesh is a fight centered around management of the extra Naga he spawns, alongside dealing with some fairly simple, yet dangerous targeted mechanics. The first of these is a ranged hit that will be applied to a random non-tank player, Throw Spear, which deals high Physical damage and a subsequent DoT. This should be healed through, and defensive cooldowns can be considered if you feel in danger. He will routinely spawn two additional Naga, a Hatecoil Crestrider (caster) and a Hatecoil Shellbreaker (melee). The latter should naturally be stacked on top of the boss with the tank, and the Crestrider should be interrupted and brought close for cleave damage. The Crestrider should be burned down as it both casts offensively and can heal Parjesh, which is extremely dangerous. Incidental cleave should be used on the Shellbreaker, and whoever Parjesh targets with Impaling Spear should then move behind the Shellbreaker to block it and deal damage to the add, ideally finishing it off. The Shellbreaker's Bellowing Roar should also ideally be interrupted, but this is a lower priority than the Restoration from Crestriders. The Impaling Spear will be announced to the marked player, who will have 5 seconds to move and react, ideally positioning themselves so that there is an add between them and the boss or, alternatively, so that there is no one between them and the boss and using a powerful defensive cooldown to survive the hit and DoT. The small red arrow underneath Parjesh will indicate the direction the spear will be thrown, so melee should take extra care to not stand in line with this. Roughly every 30 seconds, Parjesh will cast Crashing Wave, which causes him to rush forward for massive Frost damage after a 2.5 second cast, and as such all player should move from his path. It will then leave behind a patch of Quicksand in the area that was rushed over, which will deal high Nature damage every 2 seconds to players standing in it, also slowing their movement speed by 35%; it should be avoided. Finally, at 30% health Parjesh will Enrage, gaining 30% Haste until the end of the encounter. You can consider saving cooldowns for this burn, but given that Mythic+ is timed, using it at the start when you have more time to freely hit the boss is likely preferable, unless your tank is regularly dying to the added pressure. Engaging Lady Hatecoil requires killing two of the Hatecoil Arcanists that are providing Arcane Shielding. Once this is done you can engage the boss. These are the only trash you should need to pull to move on. The pack of neutral Saltsea Globules in the boss area should ideally be pulled with the boss and burned down quickly. 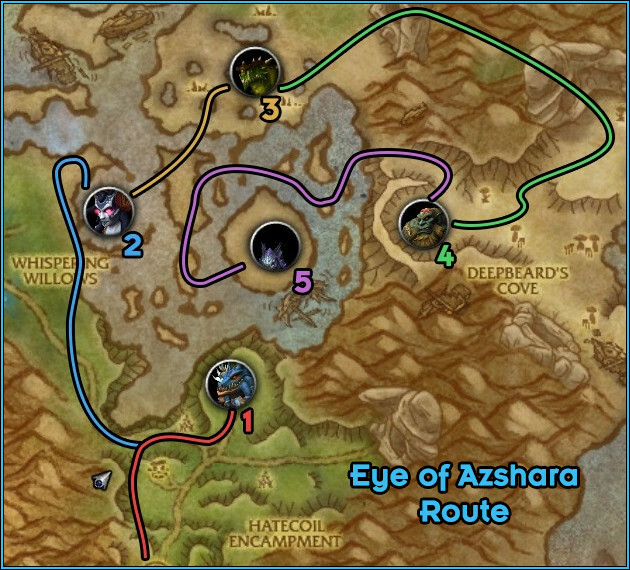 Hatecoil Arcanists can be pulled with additional mobs nearby to help with the creature count in Mythic+ if necessary, however as an enemy these are mostly interrupt-heavy. There are three separate casts, the most important of which to interrupt is Aqua Spout, which will spawn Frost damage telegraphs that will knock players into the air if not avoided. Arcane Rebound deals a moderate amount of Arcane damage to her target and then bounces to nearby targets within 5 yards. This is the lowest priority, and you should just remain spread out to mitigate it. Finally, Polymorph: Fish crowd controls a target for 8 seconds, and whilst this is disruptive, it can be dispelled by the healer. The Lady Hatecoil encounter revolves around the group shifting their positioning between being in and out of water during Lady Hatecoil's casts of Focused Lightning and Static Nova, respectively, whilst managing some other small mechanics. When casts of Static Nova occur, all players should immediately move to a Sand Dune and remain there until the cast completes, as remaining in water will deal massive Nature damage and stun them for 5 seconds, and is usually lethal. Once the Static Nova cast is complete, players should then move back into the water in anticipation of Focused Lightning, which will destroy any Dunes players are standing on when it completes. It will also deal high Nature damage, and splash to any nearby players, so you should remain spread during this cast. This cycle will continue throughout the fight, beginning with Static Nova as the first cast that will come roughly 15 seconds into the fight. You should adjust to the pattern and know whether you should be in or out of the water for the next cast, and prepare accordingly. Additionally, casters can begin the fight on a Sand Dune to mitigate some movement. Finally, Monsoon tornadoes will periodically spawn throughout the fight and fixate on the nearest player, destroying any Sand Dunes caught in the way and knocking up players they come into contact with; they should be kited around Dunes and players to avoid these things happening. Between these casts, roughly every 40 seconds, there will be a Beckon Storm cast, which will spawn 5 Saltsea Globules, one by each player. These should be brought to the melee and grouped, then players should quickly spread back out to deal with other mechanics. It should be noted that when these adds die, they will detonate with Watery Splash, dealing low Frost damage in a 5-yard radius and slowing the movement speed of affected players by 20% for 6 seconds, stacking, so melee should try to avoid this. If the tank is affected by it, they can be dispelled or they can use a snare-removing ability so that they can safely make it to a Dune in time for the next Static Nova cast. Curse of the Witch will periodically be cast on a random number of players in the group, which will do nothing for the 12-second duration of the debuff, but when it expires or is dispelled, will launch out a 30-yard cone in front of the player. This will deal no damage to players (but it will one-shot Saltsea Globules) but it will knock any players caught within it back 15 yards, and is particularly dangerous if it knocks players into or out of water when other mechanics are occurring, so you should always face away from the group. Curse of the Witch can be decursed, so bear that in mind if you are a Shaman or Druid. This blast can also be used to effectively one-shot groups of Saltsea Globules. The knockback from dispelling this will also knock back the Globules' tank, allowing them to avoid being hit by the dying Globules' Watery Splash, but be very careful when doing this as it can quickly cause dangerous positional problems. You can also do this on the timer, but usually this coincides with a Lightning cast, so is very risky to pull off without using a stun first to lock them in place, and moving accordingly. The area surrounding Serpentrix is filled with extra trash that should be cleared up to create space for the encounter. If any of the more dangerous groups are left up it will almost guarantee a wipe if pulled with the boss. There are two Stormwake Hydras that will patrol around the boss, one on the left and right, that must absolutely be pulled as they present the most group damage. These should be faced away from the group by the tank due to the frontal cone bounces from Roiling Storm, that will deal high Nature damage. At the same time, all group members should watch for the telegraphs generated by Chaotic Tempest, which also deals high Nature damage to anyone remaining in the area after 2 seconds, and bounce again twice, creating additional damage areas. Mak'rana Hardshells are the blue Mak'rana, which present a high threat for tanks. These can be pulled with other mobs, in particular in conjunction with AoE packs such as Seaspray Crabs, however be careful of the danger they will still present. Armorshell casts apply a high absorption shield that detonates when it is broken ( Armorshell Shrapnel), dealing high damage to the entire group, so interrupting Armorshell is a priority. Finally, the Mak'rana Hardshell will use Clobbering Claws which will cleave other targets within 5 yards, so players should stay clear of the tank. Seaspray Crabs come in groups of 6, which should be picked up usually with another larger creature in the bay. They are a simple group of mobs that will also attack with Jagged Claws, which will leave a light DoT to the targets hit (usually the tank). These should be AoEd down quickly though before it becomes an issue. Finally,there are a number of Cove Seagulls in the area that are non-hostile. These should still be pulled, as if they are accidentally drawn into combat during the Serpentrix encounter or when fighting Stormwake Hydras, they will present a massive threat. Blinding Peck will disorient their target and any other enemies currently fixated on the tank will run loose, likely instantly killing any melee players in range. Move from Poison Spit patches, drop Toxic Wound puddles away from the group and boss. Submerge comes at 66%/33% health, kill additional heads (the priority is Blazing Hydra Spawn > Arcane Hydra Spawn), and, interrupt casts of Blazing Nova and Arcane Blast as much as possible. Serpentrix starts out in the center of the arena, and the fight revolves around managing the additional heads that appear and the abilities each of them use after Submerge occurs, as well as efficiently moving to each head and to Serpentrix himself. Initially, you are just dealing with the Poison head which will cast two main abilities, the first being Poison Spit. This will create two swirling green circles on the ground, where after 2 seconds a projectile will land dealing moderate damage. During Violent Winds this speeds up, making it more difficult to avoid if you do not move with the winds. When this cast begins, you should start moving to avoid it as effectively as possible. The second ability used by the Poison head is Toxic Wound, which will be applied to any non-tank player roughly every 25-30 seconds. This will make the affected player drop a Toxic Puddle at their feet every second for 6 seconds, and they will remain on the ground until the encounter is over. Due to this, the affected player should try to stack them in a small area whilst moving around the edge, to minimise space wasted without creating an extremely high damage stacked puddle in one place. Melee should be especially careful to not coat the outer circle of the boss in these pools. At 66% and 33% health, Serpentrix will cast Submerge, re-emerging at a different gap in the arena and beginning a cast of Rampage. Alongside this he will spawn one Blazing Hydra Spawn, and one Arcane Hydra Spawn. The tank must immediately move to the new location of the Poison head and interrupt Rampage, then remain with that head. The DPS however must split, usually with 2 moving to the Blazing Hydra Spawn to interrupt Blazing Nova and burn it down, and one at the Arcane Hydra Spawn to interrupt Arcane Blast as much as possible. Ranged can do this particularly effectively, being able to interrupt the Arcane head whilst still helping to kill the Blazing Hydra Spawn, as the kill order will always be Blazing > Arcane due to the high AoE damage Blazing Nova represents. Interrupt rotations should be set up on both these heads, making sure to use Ranged interrupts on the Arcane head to maximise your ability to burn down the Blazing Hydra Spawn quickly with your entire group. It is also worth noting that any damage dealt to either of the additional heads spawned during Submerge will also deal damage to Serpentrix, so it is always worth dealing with them first. Lastly, note that Cove Seagulls can sometimes be missed due to not being hostile; if they are accidentally pulled during the encounter they are of the highest priority to burn down, as a disorient on the tank is particularly lethal for DPS. Again, a majority of the trash leading to King Deepbeard can be skipped, and only one large pack of Murlocs and Gilblin will be pulled in the cave. This will culminate in a pull of two Skrogs on the path leading up to the boss. One Cove Seagull can spawn in his arena, however, and should be pulled and killed quickly if your group has passive AoE. A large group of Bitterbrine Slaves will be waiting at the end of the cave, and should be pulled and AoEd down quickly. Ideally, make use of group stun effects to reduce the poison applications on the tank. There are 3 poisons, Lethargic Toxin reducing movement speed, Numbing Toxin reducing Haste, and finally Sea-Brine Toxin applying a Nature DoT. If possible, these should be dispelled. A group of Saltscale Skulker and Saltscale Lurker Murlocs will patrol through the cave and will likely be pulled, containing one Saltscale Skulker and 7 other Saltscale Lurkers. They will all apply Tearing Bite to their current target, increasing all damage taken by 10% and stacking up, so killing these quickly is important. A single Skrog Wavecrasher will be accompanied by a Skrog Tidestomper on the ramp leading up to Deepbeard's arena, each of which have different abilities to manage. The Wavecrasher will cast Rising Fury every 20 seconds, dealing high Nature damage to the group and stunning them for 1 second, alongside increasing the damage of further Rising Fury casts. Due to this ability, the Tidestomper is a priority to kill. The Skrog Tidestomper will also cast Massive Quake every 20 seconds, which will create a number of Quake patches underneath players that will detonate after 3 seconds dealing high Physical damage. These will continue to spawn for the 7-second channel, and spawn 3 Saltscale Murlocs over the duration, which should be kept together with the two Skrogs and cleaved down. Spread out during Quake, and avoid cracks for Aftershock. Use those to break Gaseous Bubbles to avoid large AoE damage. Move out of Ground Slam, and be mindful of the Enrage at 30% health. King Deepbeard is a punishing, high damage encounter and you should pay particularly high attention to dealing with each individual mechanics correctly, as mistakes are very punishing for the healer and they can quickly fall behind. The first and most noticeable ability is Quake, which will deal moderate Physical damage to all members of the group and then deal splash damage to nearby other friendly players, requiring you to spread. Cracks will also spawn in the arena, which after 4 seconds will trigger Aftershock. These deal high Physical damage every second to players who remain in the dust spawned above them for 5 seconds. Call the Seas will spawn a series of circular patches on the ground that will move erratically around the arena. These do low Frost damage every 0.3 seconds whilst inside a circle, but are mostly an annoyance and a low priority compared to the more lethal mechanics. Players will have to deal with a large ground AoE in Ground Slam, which after 2.5 seconds will deal high Physical damage, ignoring armor, to anyone remaining in the circular telegraph. Tanks should also move out of this when the cast begins, as Deepbeard will not turn or track his target. Deepbeard will also Enrage at 30% health, increasing his attack speed by 100%, making it even more pertinent for the tank to avoid extra unnecessary damage. taking a combined hit of Quake and Aftershock damage. You will always have enough time to take this before the bubble expires. Take note to move out quickly when the bubble absorb ends. if you miss the Quake and are in desperate need to remove it, you can either stand in Lightning Strike casts on the ground, or as a last resort move into a Ground Slam. The latter will definitely deplete the shield, but is more risky. Call the Seas is a poor choice to try to remove your Gaseous Bubbles, as the high movement to stay in them and low damage they deal will mean you are chasing them for an extended period of time. This impacts your damage/healing, and puts more strain on the group. You should instead try to remove the bubble as efficiently as possible with the effects noted above. Leading up to the Wrath of Azshara, 4 named summoners will stand spaced out around it, channelling. These must all be defeated to activate the boss encounter. All 4 different summoners will share two abilities, Lightning Blast and Arcane Bomb, alongside each having a separate extra spell depending on the summoner. Arcane Bomb operates the same as the ability from Wrath of Azshara itself, and Lightning Blast will do the same as Hatecoil Stormweavers, dealing moderate Nature damage. Ritualist Lesha will cast Aqua Spout, the same as Hatecoil Arcanists. This should be interrupted as a priority, as it spawns a large number of blue telegraphs on the ground that will detonate for moderate Frost damage. Channeler Varisz will gain Polymorph: Fish, which should be either be interrupted or dispelled by the healer if the interrupt is missed. Binder Ashioi will cast Magic Binding, which will root all nearby players and deal heavy damage every second. This should be dispelled, especially on melee players who are in dangerous positions. Root breaks such as Spirit Walk will also remove this on yourself, and cleanse the damaging debuff at the same time. Mystic Ssa'veh will gain the Storm ability, shared with Hatecoil Stormweavers. This deals high Nature damage every second in a circle around the caster, and should be interrupted quickly. Avoid Tidal Wave and Mystic Tornado. Avoid Massive Deluge, move out with Arcane Bomb for the healer to dispel, and stack up for Crushing Depths. Wrath of Azshara, the end boss, presents a very high awareness fight that requires players to pay attention to multiple ground effects. The encounter begins with the boss at 20% health, so execute-style effects are in play for the entire fight. Each melee attack caused by the Wrath of Azshara will also splash onto the entire party, dealing low unavoidable Physical damage that healers should take note of. The boss will also be surrounded by rotating Tidal Waves and Mystic Tornados, that will slowly move around the boss and should be avoided. Note that due to their slow-moving nature, they can be easy to mis-judge, but the boss has a very large hitbox so do not be afraid of moving further out to manage your position. Group position should ideally be clumped in one position relatively close, and you should rotate slowly around in one direction with each Massive Deluge. Massive Deluge will be cast in front of the boss around the tank, which creates a large blue zone that will deal massive Frost damage to any players still in the area when it ends, knocking them back. This should be avoided as the highest priority by the entire group, including the tank, and the 5-second cast time should be more than enough to do so. Note that any time a mechanics is failed and a player is hit by a spell from the boss, they will gain a stack of either Magic Resonance (from Arcane damage) or Frost Resonance (from Frost damage), lasting for 5 minutes and stacking. This lasts effectively for the remainder of the encounter, and as such this makes it even more important to avoid everything you can to ease stress on your healer. Next, Arcane Bomb will be cast on any non-tank player. This will cause a slowly descending bomb to drop onto the targeted player, and when dispelled, this will no longer track the afflicted player and land where they were standing. When this lands, it will deal high damage and stun any players in the area for 6 seconds. The player affected should move out of the group quickly and when safe, should be dispelled dispelled and then move back into the group. Finally Crushing Depths will be applied to a random non-tank player, creating a large targeted circle around them. This will deal 60% of the player's health in Physical damage after 6 seconds. This percentage will be split with any other players in the circle. Ideally this should be soaked by the entire group (as long as the tank can mitigate some of this, as they will be taking noticeably more damage due to its percentage-based hit). At 10% health, Cry of Wrath will be cast, which will intensify the frequency of both Tidal Wave and Mystic Tornado. On top of this Violent Winds will return, which is quite dangerous due to the requirement to dodge effects. It will also bring back Lightning Strikes into the area, causing blue patches on the ground that will detonate after 3 seconds for high Nature damage. After 10% the intensity of the avoidable mechanics ramps up significantly, so consider saving large cooldowns for this time to expedite this phase. The caveat is that movement required is also increased a great deal with extra mechanics, so capitalising on cooldowns is more difficult. A judgment call must be made on whether time is needed to beat the Mythic+ timer, in which case you should use Heroism/ Bloodlust when you pull, or doing the fight cautiously, in which case you should save the cooldown for 10% health.